SEATTLE, WA (January 29, 2015) –BEC Recordings’ artist and author Manafest was awarded his fourth career JUNO nomination earlier this week for his 2014 release The Moment. The album was nominated for Contemporary Christian/Gospel Album of the Year. The 44th annual JUNO Awards will be broadcast on CTV from First Ontario Centre in Hamilton, Ontario on Sunday, March 15, 2015. Last year, Four-time Dove Award nominee Manafest released his seventh label album, The Moment, with BEC Recordings. This album followed his highly popular and best-selling 2012 album Fighter. The Moment features 12 new songs and was produced by Thousand Foot Krutch’s Joel Bruyere (10 tracks), Adam Messinger (“Edge of My Life”) and Joshua O’Haire (“Light”). The Moment gets back to Manafest’s roots of rhyming and infusing a singing style that is his own making this his strongest and most creative effort yet. ABOUT MANAFEST: Over the past decade, Chris Greenwood has used the moniker Manafest to organically build his fan base playing over 1000 shows on 4 continents. In 2006, Manafest released Glory from which the rock anthem “Impossible,” featuring Thousand Foot Krutch’s Trevor McNevan, became a global hit. In 2008, Manafest followed up with Citizens Activ, which catapulted success garnering multiple TV placements and his overall presence in the US and internationally. In 2010, Manafest released his most critically acclaimed project, The Chase, which he received a JUNO Award nomination as well as won a 2010 GMA Canada Award. In June 2011, Manafest released his first self-titled live DVD / CD. In 2012, Manafest released his fifth studio album, Fighter, which debuted in the Top 20 on the iTunes® Rock album chart at No. 16 and was the highest career debut for Manafest landing at No. 7 on the Billboard Heatseekers chart. Manafest spent weeks touring in Japan and China supporting the international release of Fighter where he debuted at No. 8 on the Japan iTunes chart. Fighter was nominated for a 2013 Dove Award. In 2013 he released his first book with the same title as his best-selling album Fighter. In 2014, Manafest released his seventh label album The Moment. Manafest has sold more than 300,000 records worldwide. Touring worldwide Manafest has traveled to the United Kingdom, Ireland, New Zealand, Japan, Russia, Ukraine, China, Australia and the United States. Soulful sister vocalists The McCrary Sisters – long known in Nashville circles as first-call session aces supporting some of music’s most vibrant artists – will release its latest 16-track collection of soul-stirring gospel titled Let’s Go on March 10. Possessing a unique familial musical history of their own as daughters of longtime Fairfield Four tenor Rev. 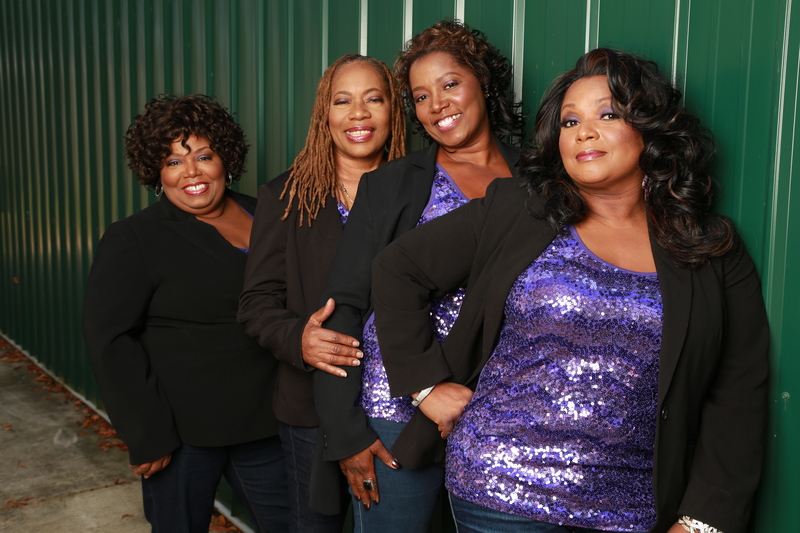 Samuel McCrary, The McCrary Sisters – Alfreda, Ann, Deborah and Regina – each bring a unique energy and virtuosity to the group, not to mention varied experiences within the worlds of pop, rock, R&B and gospel music. “That is the essence of what makes music great, it’s the essence of what makes singing great, and we really hear it in artists like the McCrary Sisters,” says NPR music correspondent Ann Powers. The end result on Let’s Go – produced by Nashville music supervisor and the sisters’ longtime musical champion Buddy Miller (Emmylou Harris, Robert Plant, Patty Griffin, others) – is a tight knit vocal style that can only be generated by women who’ve sung together their entire lives. That meshing of voices with faith and with family creates dynamic new music, steeped in the tradition of church and contemporary music. Songs like “That’s Enough,” “I Am Free,” “Walk In The Light,” “I’d Rather Have Jesus” and the title track all showcase the sisters’ talents in ways where it’s easy to recognize they’d be called on for background vocals for artists such as The Black Keys, Martina McBride, Eric Church, Jonny Lang, Robert Randolph, The Winans, Donnie McClurkin, Mike Farris and so many more. “The McCrary Sisters have a way of bringing the traditions of gospel into another format that’s unique,” says Jed Hilly, executive director of the American Music Association, whose 2014 festival featured a PBS taping titled “Rock My Soul” that showcased both The McCrary Sisters and The Fairfield Four, and which can be seen on PBS stations nationally this spring during the network’s pledge drive season. January 28, 2015, Nashville, TN – Point of Grace, one of the best-selling artists in Christian music history, announces the release of their forthcoming studio album on April 7, 2015. With a discography boasting well over a dozen albums, Directions Home (Songs We Love, Songs You Know) is a 10-song disc that features some of their favorite cover songs. Co-produced by Andy Leftwich, who is also part of the GRAMMY® award-winning group Kentucky Thunder, the album features two of the music industry’s most respected and acclaimed artists, 8-time CMA and 14-time GRAMMY winner Ricky Skaggs and 18-time CMA and 20-time GRAMMY Award winner, Vince Gill. “They are phenomenal musicians and extraordinary voices and we are absolutely thrilled that they agreed to be a part of this record,” Leigh says. Directions Home encompasses the CCM heritage that Point of Grace has played a pivotal role in creating throughout their 22 year career, as well as the Southern/Country/Bluegrass sonic foundation that has undergirded the ladies’ musicianship from the beginning, without conforming to the restraints of any given genre. Point of Grace will perform a few select dates in February before co-headlining the Spring leg of the You Amaze Us tour with Curb recording artist, Selah. Nashville, TN – 2015 has already launched as a pinnacle year for acclaimed rap artist, producer,and entrepreneur Derek Minor. As co-owner and CEO of Reflection Music Group (RMG), Minor is poised to impact the market with releases from an impressive roster of groundbreaking artists who share his musical vision, including Canon, Deraj, Tony Tillman, B. Cooper, & Chad Jones. Today, Minor unveiled his new album, EMPIRE, via RMG, and is preparing to kick off a two month run on the “From Now Until Forever” tour. No stranger to success, Minor’s most recent project MINORVILLE peaked at #1 on the Billboard Gospel Album Chart and #2 on both the Christian and Rap charts. With Dove Award and Stellar Award nominations under his belt, Minor has no plans to rest on these accolades. EMPIRE is Minor’s fifth studio album, and marks his debut under his RMG moniker. Already receiving early attention from fans and critics, EMPIRE is also turning heads in the sports and music community at large. The album received early success from fans, reaching the #1 spot on the iTunes Rap and Hip Hop charts. Minor takes the album’s theme of growing the Kingdom of God seriously, and enlisted an all-star cast of like-minded artists to join him on the project. Derek shoulders much of the production on EMPIRE but also features producer heavyweights such as SykSense (Drake, 6god), Gawvi (Lecrae, Andy Mineo), Tyshane (Lecrae, Tedashii), Black Knight (KB, Andy Mineo) and Dirty Rice (2015 GRAMMY Nominee for Lecrae’s “All I Need Is You”), and taps the vocal talents of A-list artists, including Lecrae, Colton Dixon, Tedashii, Anthony Evans Jr., and Leah Smith, to name a few. On the heels of the album release, Minor will launch the “From Now Until Forever” tour with Humble Beast Recording artist Propaganda and KJ-52 (TPC MUSIC). Special guests include DJ MORPH on each show and many others throughout the tour. Kicking off March 5, the tour is slated to hit 32 US Markets and opens up the first night at the infamous SXSW Music Festival in Austin, TX. Sponsored by NGEN and Spotify Music, the tour offers a unique advanced purchase exclusive pre-show offer to include a hip hop panel, exclusive un-released tour digital EP along with early entry to the show and one on one time with the artists from the whole tour. The tour promises to be a night focused on building and investing in the future of youth in each individual community. With a commitment to encourage, equip and enable young people to take ownership in their voices and celebrate diversity in their lives, the tour continues the EMPIRE theme, starting here on earth, “from now until forever”. Derek Minor has partnered exclusively with GOA for booking and Teresa Davis and The Paradigm Collective for management services. Derek Minor – EMPIRE. In stores and online January 27, 2015. The RMG label is distributed through eOne Entertainment. SEATTLE, WA – JANUARY 26, 2015 – BEC Recordings’ and New Zealand native Rapture Ruckus will be releasing their new digital EP, Invader Volume II, tomorrow Tuesday, January 27. This is the follow-up and second installment to last year’s release Invader Volume I. This second installment of Invader features the new song “Boomerang” as well as special guests remixes by David Thulin, Grapishsoda and Unikron. In March, both of these EPs will be made available in a special retail piece in one project and include the current radio single, “Volcano (feat. Jonathan Thulin),” which is currently charting Top 10 at Hot AC/CHR. Last year Rapture Ruckus released their well-received EP, Invader Volume I, which debuted for the first time on U.S. Charts. The album debuted on Billboard Top 200 as well as in the Top 10 on the Billboard Christian Albums chart. Invader Volume I also received two GMA Dove Award nominations for “Rap/Hip-Hop Album of the Year “ and “Song of the Year” (“Head Held High”). Invader Vol. I and II follow the highly successful 2011 release Open Your Eyes. Rapture Ruckus debuted in 2002 at New Zealand’s Parachute Festival (one of the largest music festivals in the Southern Hemisphere) breaking the event’s record for highest-selling new act. Rapture Ruckus has continued touring, supporting bands throughout North America, Europe, Africa and Asia. Rapture Ruckus released their music to the United States via BEC Recordings in 2010. The self-titled debut was nominated for a GMA Dove Award in “Rap/Hip-Hop Album of the Year” category. (NASHVILLE, Tennessee) — In anticipation of the February 10th release of Little Praise Party: Taste and See, Yancy has released a new promotional video, including testimonies from parents, pastors and recording artist Jaci Velasquez. View the video here: http://youtu.be/aJ4iiG1LRRk. Taste and See, the fourth release in the popular worship music series for young children, will be available on CD and DVD, featuring 15 easy-to-sing songs (plus two bonus tracks exclusively available at iTunes). The Little Praise Party series is available online and in Christian bookstores everywhere via Elevate Entertainment and Syntax Distribution. For church and classroom use, there is also a Church DVD available that includes all 15 songs plus the soundtracks, mp4 files and a group viewing license. Yancys Little Praise Party series engages kids from the very start with non-stop sing-along fun for the entire family. In addition to CDs, each project in the series has a companion DVD filled with exciting animation with on-screen lyrics to help visualize the words and stories portrayed within the songs. The popular Little Praise Party app, available in both iOS & Android formats, features new videos each month in English and Spanish. For more than a decade, Yancy has been making music for Christian music fans of all ages. As a songwriter, she has penned songs with Third Day frontman Mac Powell, wrote the Jaci Velasquez hit Something Beautiful and Avalon’s chart-topping I Dont Want To Go. As an artist, Yancy has released radio-friendly pop/rock albums and multiple projects for kids and young adults, while sharing the stage with Michael W. Smith, Newsboys, Plumb and many more. Yancy also pens a monthly column for KidzMatter Magazine, and has written and produced the music and videos for Standard Publishings Vacation Bible School curriculum since 2012, reaching over 1,000,000 kids each year. For more information, visit www.yancynotnancy.com. Nashville, TN (January 23, 2015) —- Award-winning author and Dove-nominated artist Andrew Peterson is gearing up for a busy 2015 that is as diverse as the multiple talents that Peterson has to offer. He started off the year by winning the 2014 Blogger Award for Best Author for his latest book, The Warden and the Wolf King, which was also honored by World Magazine as the 2014 Children’s Book of the Year. The publication is the final book in the highly-popular Wingfeather Saga series. Peterson will launch a spring tour that will include performances in the United Kingdom in late February. The tour will feature songs from his current album After All These Years, a retrospective project which showcases some of the most poignant songs from his 18-year recording career. At the same time, Centricity Music has released a retrospective video in conjunction with the record that can be viewed here, https://www.youtube.com/watch?v=xFRDDKlmkjY. In late March, Peterson’s creative community will once again partner with Laity Lodge in Texas to host the second annual Rabbit Room Retreat. The sold-out event will offer content similar to the annual Hutchmoot conference in Nashville, TN, but it is intended to provide a quieter, more relaxing, more reflective experience. Joining Peterson on the speaker line-up will be Dr. Ralph C. Wood, Professor of Theology and Literature at Baylor University; children’s book author Jennifer Trafton; author A.S. “Pete” Peterson and Dr. Jonathan Rogers, author and professor of literature at New College. Peterson will also be performing at the conference with Andy Gullahorn and Jill Phillips. Peterson is currently writing new songs for his next studio album from Centricity Music, scheduled to release in the fall of 2015. For more information about Peterson and his upcoming tour dates please visit www.andrew-peterson.com, www.facebook.com/andrewpetersonmusic or www.Twitter.com/AndrewPeterson. Andrew Peterson is a man of many talents with a successful recording and songwriting career, as well as being an award-winning author and the host of a highly popular online creative community known as the Rabbit Room (www.RabbitRoom.com). Peterson will be releasing his new studio album in the fall of 2015, while his last two projects, After All These Years and Light for the Lost Boy, received rave reviews from several media outlets. Living Light News said of After All These Years, “Peterson and his unique talent is a rarity,” while Light for the Lost Boy was hailed as “best album of the year,” and garnered two 2013 Dove Award nominations. His previous project Counting Stars debuted at #1 on iTunes, and #6 on Billboard. His single, “Dancing in the Minefields,” reached the Top 10 on the Christian AC chart, while the video for the song has received well over 1,000,000 views online. Peterson embarked on his 15th annual Behold the Lamb of God Christmas Tour in December 2014, with several of his dates once again being sell-outs. Centricity was founded in 2005 with a commitment to artist development and stylistic diversity. Based in Franklin TN, artists include Aaron Shust, Andrew Peterson, Carrollton, Jared Anderson, Jason Gray, JJ Weeks, Jonny Diaz, Jordan Feliz, Lauren Daigle, Lindsay McCaul and Unspoken. The company’s mission is to enable their artists to create life-changing experiences for the world. Providing label, management and publishing services, Centricity is a family owned organization and they like it that way. For more information on Centricity Music, please visit: www.centricitymusic.com. Nashville, TN (January 23, 2015) —- One of Christian music’s breakout artists of 2014, Lauren Daigle, continues her momentum in the new year with a K-LOVE Fan Awards nomination for Worship Song of the Year with her No. 1 hit, “How Can It Be.” The honor marks the first music industry awards show nomination for Daigle and the first K-LOVE nomination for her label, Centricity Music. The K-LOVE fan-voted Awards Show will be held at the Grand Ole Opry House in Nashville, TN on May 31, 2015. The single and title track from Daigle’s debut album immediately connected with fans, radio and media, with her powerful vocals that are drawing comparisons to pop sensation, Adele, and Daigle’s soulful lyrics. The song went Top Ten at Christian radio, No. 1 on iTunes Christian Singles Chart and was named by iTunes as one of the Top Christian songs of 2014. At the same time, the EP How Can It Be reached No. 1 on iTunes Christian Albums Chart and named as one of the Top 20 Christian releases last year by the online retail outlet. Daigle’s How Can It Be full album releases April 14, 2015 and will be available for the first time at all retail music stores, while also being listed at all online music outlets. It is sure to deliver strong reviews, with the press already saying, “beautiful album” (Worship Leader Magazine), “fantastic debut” (NewReleaseTuesday.com) and “breath of fresh air” (Breathecast). Major tour announcements for Daigle will be announced in the near future, but in the meantime please visit her website for updates, www.laurendaigle.com. (NASHVILLE, Tennessee) — Gabes Chemo Duck Program is pleased to announce the release of the official Chemo Duck App, the first app ever created for kids with cancer. The Chemo Duck App, available on iTunes for use on all Apple phones and devices, is filled with enjoyable games to help children of all ages living with cancer adjust to hospital life and treatments. The free app helps to keep kids entertained, educated and at ease while waiting for clinic visits or during overnight stays. Walk into most any pediatric healthcare setting and one thing is universal  patients are usually glued to some kind of electronic device, says Chemo Duck founder Lu Sipos. Her son, 12 year-old Gabe Sipos, is no different. Except now, 10 years after spending countless hours in clinics and the hospital during his treatment of rhabdosarcoma, he had an idea. Talk Like a Duck, Exercise Wheel, Touch and Learn, Call from Chemo Duck, Hospital Bingo and Mix and Match are all interactive activities geared toward keeping kids engaged while providing teaching opportunities. The app, Chemo Ducks first, is an additional way for the non-profit to impact the lives of pediatric cancer patients. And as Lu quickly discovered while doing research for the app, the market was ripe for such a product. Gabes Chemo Duck Program is a program of the Nashville-based nonprofit organization, Gabes My Heart, which was established in 2004 to provide education and comfort to children living with cancer through medical play using therapeutic tools. The goal of the program is to enable hospital staff and parents to prepare children for chemotherapy treatment and eliminate the fear of the unknown. Chemo Duck is a stuffed yellow duck dressed in blue hospital scrubs with a bandana around its head, a chemotherapy port on its chest and an immobilizer on his arm. In a gentle, age-appropriate manner, children learn what to expect during cancer treatment and have a friend to share the experience. In turn, children can use Chemo Duck to help friends, siblings and classmates to understand and empathize with their experience. For more information, visit www.chemoduck.org. Become A Show Hope Advocate Today By Pledging To Donate Your Birthday This Year! Nashville, Tenn – 22 January 2015 – Show Hope,™ founded in 2003 by multi-award winning Steven Curtis Chapman and his wife Mary Beth, a New York Times‘ best-selling author, is a nonprofit organization that helps restore the hope of a family to orphans in distress. One of the organization’s primary objectives is to mobilize individuals, students, families, and communities to join them in caring for the world’s most vulnerable children. From their Student Initatives program (including the Red Bus Project for college students and The Movement for high schoolers), short-term trips for teens and adults, monthly sponsorship program, the Brown Bag Campaign and more, there are numerous many ways to get involved in the movement to care for orphans. This month, Show Hope is highlighting one such program – their Advocate Program. WHAT IS A SHOW HOPE ADVOCATE? Show Hope advocates are grassroots leaders who raise funds and awareness in their communities by utilizing their talents, gifts, and passions to speak up for orphans in distress. Advocates are doing amazing things such as donating their birthdays, running marathons, hosting garage sales, collecting change, hosting a clothing swap and so much more…all to restore the hope of a family to waiting children around the world. Above all, the Show Hope advocate is a voice for the fatherless. Do you want to become an advocate? This month Show Hope is asking advocates to donate their birthday. In lieu of presents, advocates will ask their party guests to bring a monetary donation or needed items for one of Show Hope’s Special Care Centers. This time can also as be used to share about the plight of orphans and the work of Show Hope. For an example of how two Show Hope advocates, Aphiwe and Jenni, gave up their birthdays for those in need, click on their images below to read their stories. To find out more about being a Show Hope advocate and the numerous ways you can participate, please click here. ABOUT SHOW HOPE: Since its inception, Show Hope has helped provide forever homes through Adoption Aid grants for more than 4,500 orphans from 50+ countries, including the U.S. In addition, more than 1,600 orphans with special needs have received critically needed medical care through Show Hope’s Special Care Centers, giving them a hope for a family and a future. Through numerous initiatives designed to engage individuals, students, families, and communities, Show Hope is mobilizing a movement to care for the world’s children who need it most. Show Hope is continuously developing a variety of programs to mobilize the church body to get involved and to help transform the life of an orphan. From their Student Initatives program (which includes the Red Bus Project for college students and The Movement for high schoolers), to their short-term trips for teens and adults, their Advocates program and the monthly sponsorship program, there are so many ways to get involved in the movement to care for orphans. To find out more information, please visit ShowHope.org and on the links below.